Today I’m excited to introduce you to my friend, Kristin Demery. Kristin and I work together on the website for a statewide women’s ministry, Bridging the Gap. She calls herself a grammar geek, and reads much deeper books than I would ever consider. She’s an amazing editor who teases me now and again about my love (and overuse) of commas. I know if you ever met her you’d love her as much as I do. I’m so happy she’s sharing her words of encouragement with us today. Wiping the dust from the grassy ball field on my shorts, I looked up just in time to see a red rubber ball blotting out the sun. The slow-motion effect suddenly sped up to warp speed as the ball whammed into my face with a resounding thunk. At the ripe age of 8, it was a total eclipse of humiliation. I felt utterly embarrassed. And even though I don’t remember anyone laughing at me, I felt the weight of rejection, too. I vowed never to play kickball again. My non-athleticism carried with me into early young adulthood. I gave up playing basketball after failing to ever get a foul called on me during the season. Not aggressive enough. I gave up volleyball after a few years of lackluster playing because my heart just wasn’t in it. Not athletic enough. Like my kickball encounter from years before, I felt the weight of rejection. I just couldn’t measure up to a standard set by others, so I wondered: Why even bother? Instead, I found comfort and community in other things. I think that sometimes, as Christians, we can feel like my 8-year-old self, staring down at a red rubber ball of humiliation. We wonder why we don’t quite fit in, question our role or our purpose. We see other people who call themselves Christians, and yet, we can’t identify with them at all. We’re misfits. It’s a good thing, then, that Jesus loves misfits. In fact, he’s infamous for taking the on-the-outs folks who don’t quite fit in and using them to accomplish great things. He took Saul, who terrorized Christians, and turned him into the apostle Paul. He took hated tax collectors and regular, blue-collar workingmen and made them part of his inner circle. He embraced sinners and scorned so-called saints and loved people with a scandalous grace that the world couldn’t quite believe. All this and yet we still struggle, don’t we? We think that because Jesus was perfect, he couldn’t possibly understand our struggles, our heartaches, our longing for more. Yet he not only understands us, he invites us to be part of building his kingdom. He tells us, “You’re blessed when you’re at the end of your rope. With less of you there is more of God and his rule” (Matthew 5:3, MSG). We’re no longer the last person to be picked for kickball, we are joint heirs with Jesus. Adopted into his family. Accepted even when we wonder how we could possibly be acceptable. The good news of the gospel? That’s it. Everybody’s in. 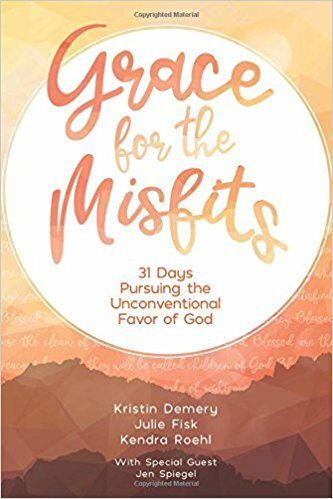 Kristin is SO excited to announce that her new book, Grace for the Misfits: 31 Days Pursuing the Unconventional Favor of God, is available now! This book will offer encouragement and hope for anyone who has ever felt like they didn’t quite fit in, walked through hard times, or wasn’t sure God could use them–all while discovering the upside-down ways of Jesus, his kingdom, and what (and who) he says matters. Find out more information here. Please Sign me up for the chance to win. Excited for Thrive! a mentor mom for a Mops group and would love this book to share with my dear Mamas there. Thanks for your comment, Karna. Your MOPS moms might also enjoy Grace for the Imperfect Mom by the same authors. I look forward to each of your blogs. Enter my name in your drawing for ‘Grace for Misfits’. many new friends there. Even some others from CF. And I took a computer class too. So thank you!! Sounds like a great devotional. Count me in on the drawing—will no doubt get a copy for myself if I’m not a winner! Reminds me of when I tried out for a softball team in my early 20’s and a ball hit me between the eyes. I fell down and when I woke up, I was too embarrassed to stay for the rest of the tryout! I would enjoy this devotional. We are all misfits in great need of grace from God and each other. Good read. I can totally relate Kristen! Thank the Lord for His overwhelming grace and the encouragement to share that grace with other women!